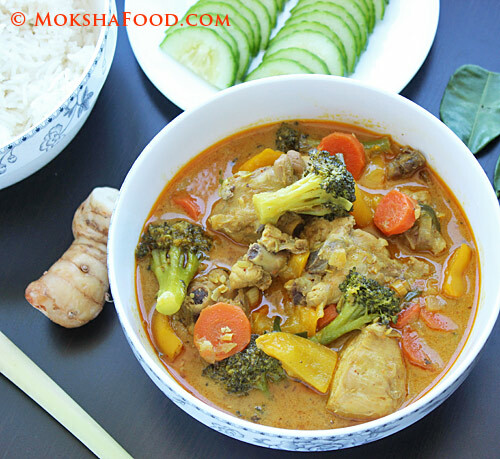 MokshaFood blogs about healthy, delicious, Gluten Free Indian Food. All recipes are egg free and corn free too. Also tips and suggestions are provided to manage food allergies. Never miss a recipe! Subscribe today! I am in love with Thai Food. Even more so now since I could manage to source out some of the key ingredients like lemon grass, galangal and lime leaves. There's no looking back for me. Gone are the days when Thai food was prepared in my kitchen with a canned paste of thai spices and a can of coconut milk. It tasted good but now its heavenly. The aroma of freshly crushed galangal and lemon grass transports you into another world. Thai cuisine has similarities with Indian food with its complex flavors- the sweet, spicy, tangy and bitter elements complimenting each other in perfect union. And yet its so refreshing different. Every cuisine has many regional alterations but the base flavors of Thai food are the lemon grass, galangal, lime leaves and thai fish sauce. Thai Restaurants serve popular options which are usually meat, seafood or vegetables served in a choice of green, red or yellow sauce . Each of these sauces have a common base with added ingredients to create signature flavors.The green of the green curry is because of the fragrant Thai basil. The red hue is contributed by the thai red chilies and yellow is the curry paste/powder added. My recipe may not be 100 % authentic as I didn't have access to the Thai fish sauce or the Thai red chilies but it was the closest and most flavorful Thai curry that I have made to date. The biggest advantage was that I could load up the chicken curry with as many vegetables without the carnivores in my family complaining. I served the Thai Chicken curry with Coconut rice for a lovely Sunday Feast. Heat 2 tablespoons of oil in a large saucepan to medium. Add in the lemongrass and galangal and saute for about 5 minutes till they are nicely fragrant. Now add the garlic and shallots and cook till they soften. Stir in the curry paste and 1/4 cup of coconut milk and let this paste cook for 2 minutes more. Pour in the tamari, vinegar, sriracha with the brown sugar and turmeric powder. Add the carrots, chicken pieces with salt and mix well to coat the pieces with the gravy. Pour in the remaining coconut milk and cover and cook till the chicken is almost done. You can add about 1/2 cup of water to thin out the gravy, if needed. Now add in the broccoli, bell pepper, spring onions and lime leaves and cook for 5 more minutes till vegetables are tender. Taste to balance all the flavors. It should be spicy, sweet and tangy. 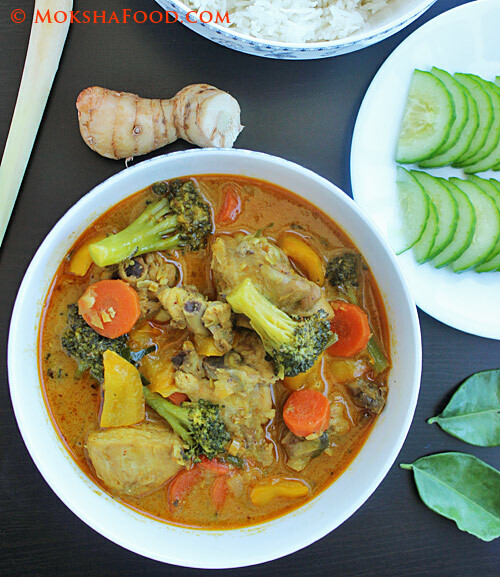 Serve this steaming thai chicken curry with coconut rice. Add all ingredients in a saucepan and bring to a boil. Lower the heat, cover and cook till all the water has got absorbed and the rice is cooked. Fluff up with a fork and serve. Chapati/ Roti/ Poli - Different names for a simple flat-bread made in most Indian homes on a daily basis. Its usually made up of whole wheat which is freshly milled at the local flour mill. The most common carbohydrates consumed in an Indian diet are rice and wheat. Interestingly potatoes and corn are considered more as vegetables than carbs. In fact you can segregate the Indian populations geographically with North India relying heavily on wheat as opposed to South Indians being rice eaters and a whole segment in between who need both rice and the wheat chapatis in each meal. Happy Holi to all of you! May Holi bright up all your lives with beautiful colors! Upma is traditionally made for breakfast in South Indian homes . Its main component is Rava or Cream of wheat. To make this gluten free, i have swapped the Rava for cream of rice or Idli Rava which is easily available at Indian grocery stores. This is a mild tasting but very filling breakfast. You can add more vegetables if you like. Heat oil in saucepan over medium heat. Temper with mustard seeds and let them pop. Add chopped onions and sauté till soft. Add grated ginger and chopped chilies. Add raisins and cashew nuts if using. Add peas and the water. Let it come to a boil. Flavor it with salt and sugar. Add the idli rava and stir to mix well. Welcome to MokshaFood. I am a wife and mom of a child affected with food allergies. Through this blog I share my experiences, tips and recipes created to feed my family healthy, delicious gluten free, egg free and corn free food. I specialize in Indian Cooking and love to experiment with world cuisine creating Fusion recipes. Earthy Mushrooms flavored with Shahi Jeera! Tom Kha: Thai Seafood Coconut Curry! Chickpeas in Spicy Coconut sauce! Goat Meat /Mutton Curry with Dill! Easy and healthy Paneer Makhani!